As part of the wonderful Footfall Project from the Gravesend Arts Consortium, we are running creative writing workshops – a version of the WordShed lite. The first workshop was held on 19 April and the next one is on 10 May. Sam is happy to be involved with an exciting arts project in Gravesend, where she will be hosting two free writing workshops as part of the Footfall project. Footfall is a project organised by Wendy Cottam, of Gravesend Arts Consortium. The project brings together artists from Gravesend and beyond, to make work publicly in spaces in Gravesend’s market. 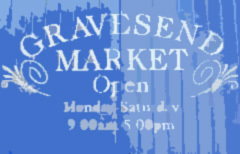 There will also be a series of workshops and exhibitions, to be held every Saturday from March 22 to May 31 in Gravesend Borough Market, off the High Street. Sam will be hosting a version of the WordShed in the market on 19 April and 10 May (tbc), from 1.30pm-3.30pm, where attendees can expect to do a range of fun writing exercises, inspired by their Gravesend location. Find out more about the Footfall project on Facebook. Here is the collaborative, collective poem that we wrote as part of the Word Shed’s visit to the Rochester LitFest Garden Party. Her mind had wandered out to sea. He croaked again, while she was on the waves. Rodents don’t shed a tear. Even when staring down the abyss. Time is precious, so use it well. Heat raged from the factory beyond. Shouting, screaming, yelling, heard from the factory beyond. And left her standing there. Save me from this wretched place. I’m stretched out like a tabby cat in the sun. And she dreamed her dream to sail far. Long may the maiden voyage float. The sun came out and we temporarily transformed the smoking lean-to at the Good Intent into the Word Shed for the afternoon of 14 July 2013. * Roll the dice poetry or prose. A great afternoon was had by all and we will post some of the poems – including probably Rochester’s longest – in due course. The Seed Compendium contains large selection of additional creative writing from the Fuse Festival and our WordShops. You can read it online or download it from the Words page. It is 50 pages long and really gives a fantastic snapshot of the creativity we encountered in Medway during the Fuse Festival. There are poems and writing from all ages in the booklet and we hope that you will enjoy it, and excuse any typing errors we might have made! If you would like to get hold of a printed copy of The Seed Catalogue, our much shorter booklet, there are still some copies at Chatham library. 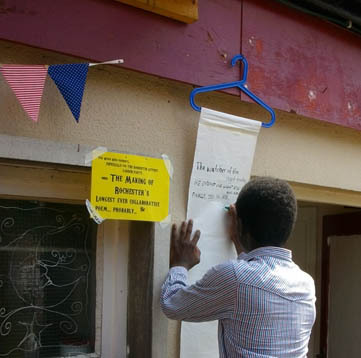 Come along and sit in our lean-to between 12noon and 4pm on Sunday 14th July, at the Good Intent Pub in John Street, Rochester, where you can do some writing themed around summer. The party will feature a delightful cultural mix of performances, open mic, storytelling and a special edition of Seasonally Effected. There might even be an opportunity for you to sit on Charlie’s Chair… wait and see what that is! And that’s it for the Fuse Festival this year! 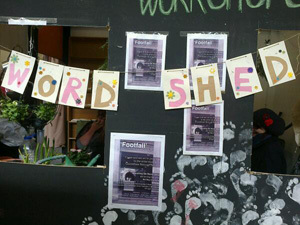 We had a fantastic response to The Word Shed at the Fuse Festival. We had almost 100 people from ages 3 (with some help from mum!) 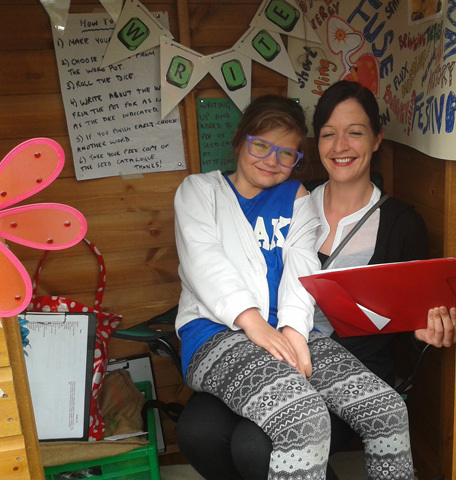 to 90, who took some time out from the festival (and the sometimes rainy/windy weather), to sit in the warmth and shelter of the shed to do a bit of writing. A lot of those who visited had never had a go at creative writing before, or hadn’t really done any since school, and told us they really enjoyed the opportunity to share their stories. For those littlies who weren’t quite up to writing in the shed, we also had large pieces of paper on the pavement in Gillingham and Chatham, where they could express themselves in words or pictures, and we had a brilliant response to this too, with one visitor telling us she had come specially from Gillingham to Chatham the next day, as her children had enjoyed writing on the pavement paper so much! On the last day of Fuse, we launched our Seed Catalogue booklet. This is a creative writing pamphlet containing a selection of writing done during our creative writing workshops (WordShops) in the run up to the festival. We handed out a copy to anyone who came to the shed who wanted one, and also did some readings from this new publication. A few remaining copies will shortly be available from the libraries where we did our WordShops. You can also download it from the Words page. We will be typing up and getting all the photos together this week and next, and hopefully have a full PDF of everything we could type up ready to download by the end of the month. If you would like to hear more about ME4Writers’ future projects, please send us an email, or follow our blog.